The goal is to serve a different pasta dish every week for a year. 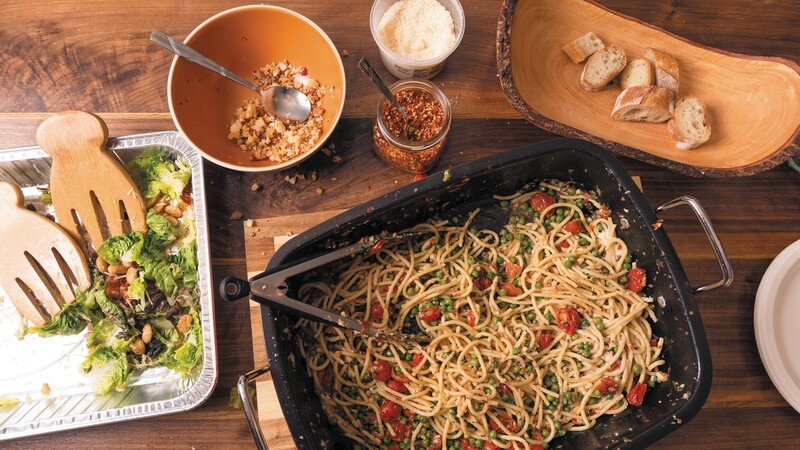 Pasta makes it easy to feed a crowd. There was also, this evening, a salad of young lettuce, fried lemon, chorizo, and corona beans. And instead of a final topping of croutons or grated parmesan, Arevalo shredded an entire loaf of bread, toasted it, and mixed the crumbs with diced pancetta. There were cheers, and then the mumbled din of 30 adults and 15 children assembling, slurping, and enjoying their meal. The event was part of Pasta Friday, a near-weekly series of dinners Arevalo began hosting in August of last year. The goal is to serve a different pasta dish every week for a year — 52 dishes in all — culminating in a cookbook of the same name. This evening’s event marked number 30. Arevalo cofounded Temescal’s popular mac ’n’ cheese restaurant Homeroom in 2011 with Erin Wade. Though rewarding, the experience left her feeling isolated from her community. “After opening a restaurant and having kids, it just became really hard to have a social life,” she said. A sponsorship from pasta maker Rustichella d’Abruzzo ensures that not only is Arevalo sure to never repeat a dish, she is likely to never repeat a shape. The company offers more than 120 different varieties. “They really were into the idea of the 52 dinners and their pasta is just amazing,” said Arevalo. Space is a limiting factor, though, even if cost isn’t, and attendance is restricted to just how many people the chef can comfortably fit in her house. “More than around 30 and people don’t socialize so much,” she said. But, she adds, the number could go up if she were to prepare a Pasta Friday in a bigger house — in other words, if any East Bay residents were open to handing over their kitchen for an evening. For those who can’t make it to one of Arevalo’s dinners — or who prefer to play host themselves — the chef makes it easy to throw your own with weekly newsletters. Subscribers get tips, recipes, and notifications of upcoming meals, all of which come free of charge. Money may make the world go round, but pasta can be at least one of the things to hold it together.